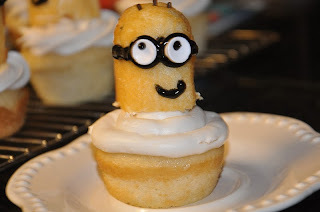 I have had my eye on these cupcakes I found on Pinterest ever since two cute boys would not stop quoting Dispicable Me during dinner! And they were SO excited when I brought these treats to their house today! p.s. For some reason the fb pic wouldn't load...I must know that other boys do things like grow fu manchus and dye them black. How fun! I love these, simply creative. Thanks for sharing!!! I don't know much about Despicable Me, but these are super cute! I bet the boys loved them! And twinkies, yum! I would have eaten like 2 before I even finished these! I pinned these on pinterest! I want to make them so bad! those are super adorable elizabeth!! how creative you are! These are great! I'm so glad I found your blog. I'm a former Baylor girl, too :) You have the best recipes on here! Thanks for sharing. HOW CREATIVE!! Oh my gosh! Ha Ha- so cute!! I think my nephews would love these for their next birthdays! Praising Him through our tears. .